I watched a Youtube video about eating raw garlic to prevent and treat winter colds. Bill got a cold so I started using my stash of homegrown garlic. 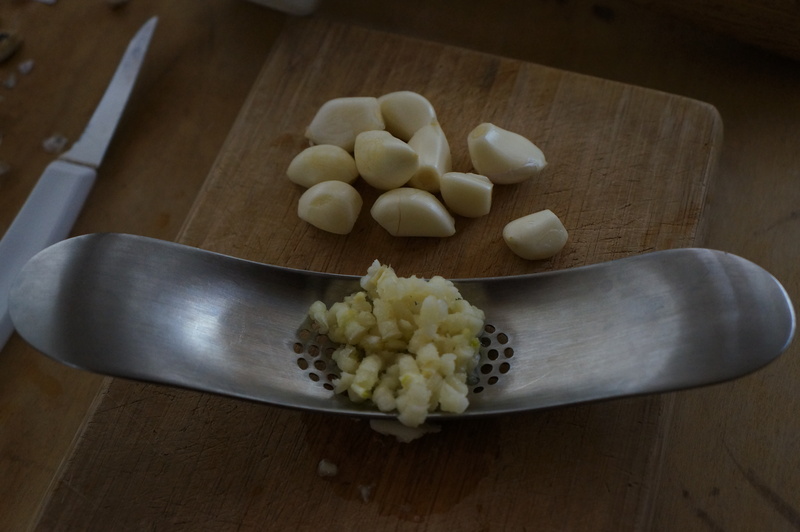 My Joseph Joseph garlic crusher has been getting a lot of use as a result. Every day we’ve been peeling, crushing, and enjoying it in salsa with a few chips as advised in the video. You have to do something to disguise it because it is some powerfully burning hot stuff! The guy on the video says eating raw garlic will cut short any cold you pick up so this was going to be a good test. What do you know!? Bill’s cold never got very bad and it was gone in 2 days. I never got it. We have continued our daily raw garlic regimen. I have noticed it gives me a warmth in my chest after I eat it. Quite a nice feeling on these bitter cold Wisconsin days! Have you ever eaten raw garlic? If so, what is your favorite way to disguise it?